For a brief moment I felt wary about Merete Mueller and Christopher Smith's TINY: A Story About Living Small. I was fearing the worst case scenario. 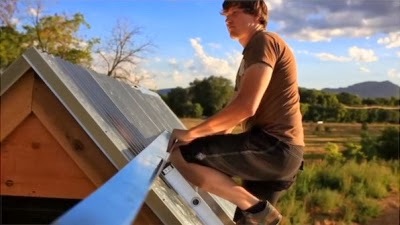 The set-up of the documentary involves Christopher and his girlfriend Merete attempting to create their own tiny house. A tiny house/small house is a dwelling of about 100 to 200 square feet that contains all the necessities to live. Christopher admits that he's never attempted anything like this before, but he's a little too confident about his abilities at the start. It usually takes people a year or two to make their own tiny house, but he thinks he can do it in a summer. The early stages of construction that are caught on film reveal the difficulty of the whole endeavor. The worst case scenario I feared was this: that TINY would devolve into a vanity project by and about well-meaning bumblers who've glommed on to a popular movement for simple living. Thankfully TINY avoided that trap. There's very little (if anything) that's vain about the documentary or its makers. At heart, both Christopher and Merete believe in the larger ideas espoused by those in the tiny house movement and they take their project seriously. What seemed at first like misplaced hubris was really just a kind of barely contained enthusiasm, sort of like a kid who can't wait to finish building a toy so he or she can finally have fun with it. Much of the tiny house movement has its intellectual roots in Henry David Thoreau's Walden, that seminal transcendentalist work about connecting with nature and the idea of simple living. Regardless Thoreau's actual circumstances while at Walden Pond (e.g., he routinely dropped off his laundry at his mom's place a mile or two up the road), there's something to be said about the joy of simple living and being able to disconnect from too much stuff and too much clutter. There's also the ability to reconnect with the land. Christopher bought a huge plot of open space where he wants to eventually settle this tiny house, though since it's on wheels, it can technically be hitched to a truck and taken wherever zoning laws permit. What interesting about this idea of simplifying life is the kind of sophisticated innovations that tiny house adherents have applied to the design of their homes. Merete and Christopher interview a number of people who live in tiny houses, and all of them have smartly made the most out of the space they have. Tables and other sorts of furniture can be modified or stowed away, surfaces serve multiple purposes, rooms (or really, room) are multi-function. The movement is as much about thinking simple as it is thinking smart. There may be a connection between the way constrained writing techniques lead to greater literary creativity (e.g., the Oulipo crowd) and how limited space and materials leads to a more creative use of available space and materials. 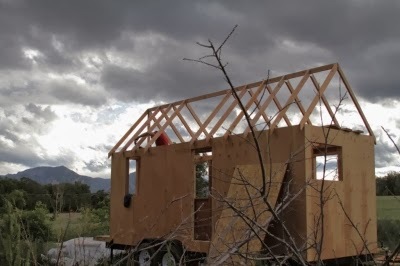 As we watch Christopher and Merete struggle with building their own tiny house, there's a dawning understanding about the work they're doing. On the surface, they're just getting better at working with their hands. How many of us really know basic carpentry? And how many of us are motivated enough to try to learn and risk the failure? If TINY had been a vanity project, there would be no sense of growth in these sorts of actions or the risk of having to learn anything. What comes through in the film is that in making a tiny house, the builders aren't just creating a compact and functional living space; they're also exploring ideas of home and place, and what space means and what space can be, and also what materials are and where they come from. In the end, TINY is about the various forms that informed ownership and informed action can take. I couldn't help but think I was watching people in the process of discovering a better way of living, and it didn't necessarily have to do with limited space so much as improving the quality of available space. To really engage with a dwelling like the people in the film have done opens up ways to live a little bit wiser and more responsibly than before.